If you have been thinking about getting a ferret as a pet, you should make sure that you have done the proper research. These little guys can be a great pet for some people. There is no doubt that ferrets are adorable little creatures. They have been kept as domestic pets for centuries. Although they have a long history as human companions, many people don't know very much about them, or their ways. Before you consider getting a ferret as a pet, there are some things that you should consider. In the long run, both you and your ferret will be happy that you took the time to learn about basic ferret care. So, don't start searching out ferrets for sale just yet. Make sure that a ferret is the right pet for you. Ferrets are not really like a dog or a cat. People often do not realize or consider this. If you buy a ferret with the expectation that they will be acting like Fido or Fluffy, you may be disappointed. They have their own special type of appeal. They love to play, and many of them also love to sleep... A LOT. Once you own one, you will get a feel for what their personal rhythm is, and you will get used to it before very long. These little guys are often called the clowns of the pet world. This is because they are so enthusiastic and their natural curiosity often leads to some amusing situations. Just as with a dog or a cat though, each ferret can have its own special personality and quirks. To learn those, you'll have to actually spend some time with your pet. Before you ever get a ferret, it is vitally important that you understand a few things. First off, resist the urge to make an impulse purchase at the pet store. I cringe every time I see a little boy or girl pointing to the cute little ferrets in the local pet store, trying to convince their mom or dad to buy one for them. It isn't that I don't want anyone else to own a ferret, I just know that they are not a pet to take on lightly. Ferrets sometimes have a lifespan of ten years. They are not a pet that you should buy on a whim. They also can be a handful to take care of if you aren't ready for them. Marshall polar toys are made of soft fleece with a bell in the center providing your ferret with hours of playtime fun. You won't be able to keep your ferret or small animal off the ski slopes once they don the Marshall tassel hat. Marshall ferret and small animal santa suit. Crikey. It's the Marshall hide-n-sleep alligator. This great interactive toy will give you hours of watching pleasure as your ferrets bring this alligator to life. Assuming that you have done all of the proper research, and understand what you are getting when you buy a ferret, there are some things to keep in mind from the get go. You should thoroughly ferret proof your house before you bring the little guy home. This means making sure that you have done your best to keep it safe. If you have uncovered heating vents, or wires that dangle like a tempting toy, you should get them dealt with before your ferret finds them. These little guys are very curious creatures. You wouldn't want your new pet to get lost or hurt on its first day home, would you? Also, make sure that any kind of dangerous chemicals are well out of reach. You should be supervising your ferret when it isn't caged, but you really cannot be too careful when it comes to ferret proofing. Ferrets are very accomplished escape artists. In the even that your furry little friend gets loose, you will be glad that you took the time to make things ferret friendly beforehand. Once you have removed all of the potential dangers to your pet, make sure that you have a quality ferret cage waiting for him or her. Some people might think that the idea of a cage is cruel, but like I said, a ferret is different than a cat or a dog. The cage is a safe home for your ferret when you are not spending time with it. You should never let your ferret roam about the house freely. That is just asking for disaster to strike. What you can do is make sure that you have purchased a cage that is big enough for your ferret to move about and play a bit. You don't need something that takes up half of a room, but don't cheap out on it either. Also, never try to use a box as a cage. Your ferret will make short work of escaping and you will be wishing that you had just bought a good cage in the first place. You will have your ferret for several years. If you can't afford a proper cage and the other supplies that your pet will need, don't get a ferret yet. There are some wonderful cages available for ferrets nowadays. Many come with multiple levels, which increases the space that they have to exercise, explore, and play. Remember that if you are going to buy more than one ferret, you will need a bigger cage to accomodate them. You can check locally for ferret cages, but be careful if you are buying a used cage. You will also be buying whatever might have been left behind by the previous occupant. Your short term savings could quickly be wiped out if you have to make an expensive trip to the vet with a sick ferret. I recommend looking for a new cage that is built to last. When you start shopping for ferret cages, you will sometimes find that retailers try to sell small cages at low prices. Be sure to read the reviews of these cages. You will often find that ferret owners have found them to be too small after the ferret reaches adult size. Below you will find some of the best selling (and best priced) models around. 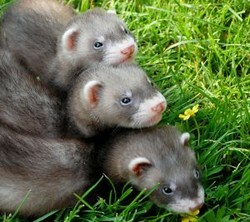 These are also models that ferret owners specifically left good comments about. Amazon often offers their Super Saver Shipping on these, so please click on the image to read all of the details and reviews. Ferrets as pets can be a lot of fun, but you have to make sure that you are ready to provide a good home. You also have to be ready to devote a fair amount of time to hanging out with your new buddy. Don't get a ferret if you only intend to stick it in a cage and forget about it. That really isn't fair to the ferret. If you are ready to have a fun little furball to share some floor time with though, a ferret might be a good match for you. There is a lot to know about pet ferrets, and I'll be writing more about it in the future. I hope that you found this post helpful. Please share it or leave a comment if you did. A sable ferret can be a lively addition to your family. Get some fun facts about the sable ferret and learn what you can expect as an owner to this exotic pet. Don't waste your money on store-bought rabbit toys. Learn how to make easy and cheap toys that will provide hours on entertainment.